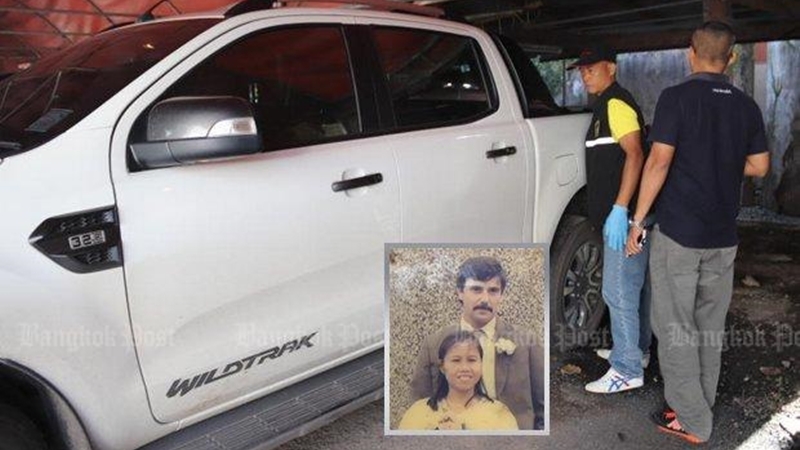 PHRAE: Police found a pickup truck owned by a missing British millionaire (previously reported as Australian) and his Thai wife yesterday (Sept 24), and arrested the woman’s brother in connection with the couple’s disappearance. Retired British national Alan Hogg, 64, and his wife Nod Suddaen, 61, were reported missing last Thursday (Sept 20). Warut Satchakit, Mr Hogg’s brother-in-law, was arrested by the police after CCTV footage allegedly showed him entering the couple’s home and driving away with the truck on the morning of the couple’s disappearance. He was released after his relatives posted B100,000 bail. When investigators went to the couple’s home in Phrae’s Muang district, they noticed their white Ford pickup truck was also missing. The couple is known to have lived in their large compound, comprising a two-storey house and a cattle yard, for years. Police found bloodstains on the floor around a sink and in a washroom near the swimming pool. A charging mobile phone was also found at the scene. Phrae police chief Maj Gen Sanpat Prabpudsa said sniffer dogs have been sent to the scene and police are checking contacts found listed in the phone, in the hope of shedding light on the mystery. Maj Gen Sanpat said the truck was impounded in Ayutthaya on Sunday (Sept 23), and returned to Phra That Chor Hae Police Station yesterday for forensic work. The vehicle is registered in the wife’s name. Investigators found that the truck had been bought from a Thai couple by a Lao man. The sellers and buyer agreed to meet in Sri Samrong district in Sukhothai to close the deal last Friday (Sept 21). The Lao man then drove it to Ayutthaya on a business trip, until he learnt from media reports that police were looking for the vehicle, Maj Gen Sanpat said. The man turned the truck over to police in Ayutthaya on Sunday. He and the two sellers were then taken to Phra That Chor Hae Police Station to be interrogated. Col Amorn Kwangpaen, an investigator at Phra That Chor Hae Police Station, said that last Thursday investigators found a backhoe near a hole that had been dug and then filled in. The hole was excavated, but police did not find signs of any bodies buried there. A person, whose name was not disclosed, reported the couple missing last Thursday, telling police the couple had not been answering messages or phone calls since last Tuesday (Sept 18), when they were supposed to meet in Chiang Mai.